This unique 8 day trip is operated visits remote Tarahumara villages, frontier mining towns, and colonial cities. Families enjoy a train ride though the Sierra Madre Mountains and stop at various look-out points for breathtaking views of the canyon. Arrive Mexico City 1 Night > Flight Los Mochis> Drive El Fuerte 1 Night > Drive Bahuchivo 2 Nights > Drive Creel 1 Night > Drive Posada Barrancas 2 Nights > Drive El Fuerte 1 Night > Drive Los Mochis> Flight Meixo City & Leave. Transfer to the charming colonial gateway to the Copper Canyon, El Fuerte. Check in to our beautiful historic lodge and then roam the cobble stone streets for a taste of old Mexico. Relax and wander this quaint and historical city. Overnight stay at the Hotel in El Fuerte. All aboard the world famous Chihuahua al Pacifico (El Chepe) train trip into the Sierra Madre Mountains (170 km). This comfortable first class train leads us through dozens of tunnels and over countless bridges with exceptional opportunities for taking pictures or just enjoying the view. We arrive in the early afternoon to Bahuchivo. There will be time for walks around and enjoy the countryside. Later this evening a Mexican dinner awaits. Overnight stay at the Hotel in Bahuchivo. 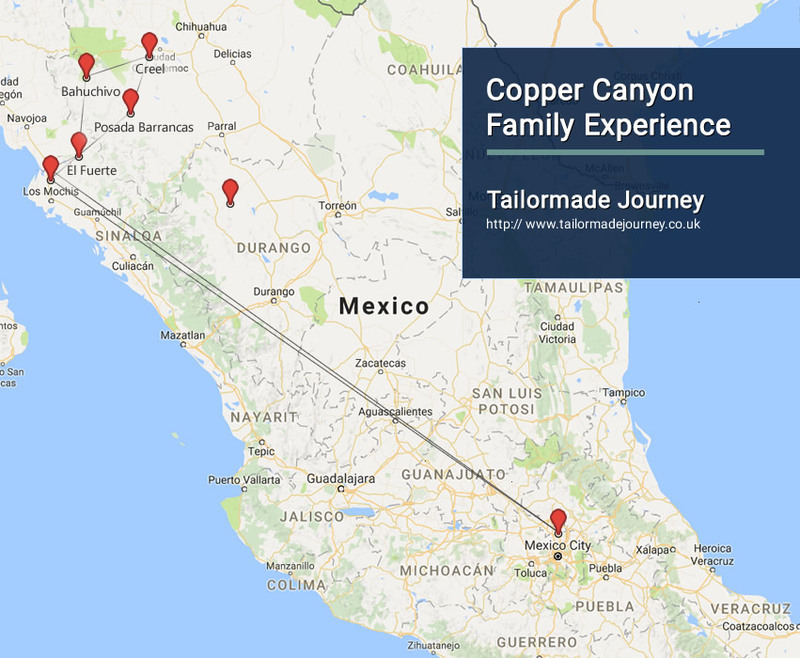 After breakfast, we will have a chance to further explore and enjoy the rugged canyon terrain with a private tour to Cerro del Gallego for an amazing overlook of the Copper Canyon. Back onto the train and on to Creel (120 Km), the frontier logging and mining town turned tourism center of the Copper Canyon. Check into our cozy lodging at Best Western the Lodge at Creel Hotel & Spa. Afternoon arrival will give you time to wander the many gift shops; make sure to try and buy directly from the Tarahumara indigenous people who are usually selling their crafts on the main plaza. Alternately, the crafts cooperative contributes to the local communities. Overnight stay at the Hotel in Creel. After a hearty breakfast and hotel check out, meet your guide to explore by vehicle the Lake Arareko, Valleys of the Monks & Mushrooms. At Arrival settle into your lovely hotel and admire amazing views of the canyon. The late afternoon is free for relaxing or exploring the canyon terrain around the property, to later enjoy dinner on property. Overnight stay at the Hotel in Posada Barrancas. After breakfast today, meet your expert guide to learn more about the canyon and enjoy amazing views such as the Otero Canyon – 1520 meters depth, and the Fertility Rock. Later today experience the crossing of the canyon in a spectacular cable car ride (one of the highest in the world) to a breathtaking viewpoint from where you can marvel at three of the main canyons, including the Copper Canyon itself – affording magnificent views of Tarahumara Indian ranchos in this expansive canyon system. You may also experience an amazing Zip line excursion, with spectacular overviews of the canyon, and other optional activity. You start the day with breakfast and a chance for a final walk or souvenir shopping with the local crafts vendors before your early-afternoon transfer to train station, back onto the train and on to El Fuerte, the charming colonial gateway to the Copper Canyon, check into your cozy lodging at Posada del Hidalgo.This evening you are free to roam the cobble stone streets for a taste of old Mexico exploring the charming town of El Fuerte on your own. Transferred to Mexico City to board flight for onward Journey.